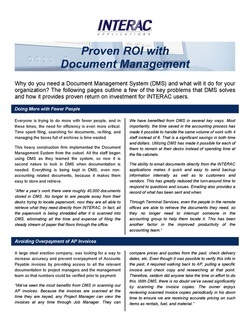 Proven ROI with the INTERAC Document Management System - Intersoft Systems, Inc.
​Why do you need a Document Management System (DMS), and what will it do for your organization? ​Following are a few of the key problems that DMS solves and how it provides proven return on investment for INTERAC users. Everything is kept in DMS, even non‐accounting related documents, making them easy to store and retrieve. No longer to are people away from their desks trying to locate paperwork; they are able to retrieve what they need directly from INTERAC. Paperwork may be shredded after it is scanned into DMS, eliminating all the time and expense of filing. Time saved in the accounting process makes it possible for fewer staff to handle the same volume of work. Email documents directly from the INTERAC applications to send information internally, to customers and vendors. Through Terminal Services, staff in remote offices are able to retrieve the documents they need. Increase accuracy and prevent overpayment of Accounts Payable invoices by providing access to all the relevant documentation to project managers and the management team so that numbers can be verified prior to payment. Because the invoices are scanned at the time they are keyed, any Project Manager can view the invoices at any time through Job Manager. Compare prices and quotes from the past, check delivery dates, etc. 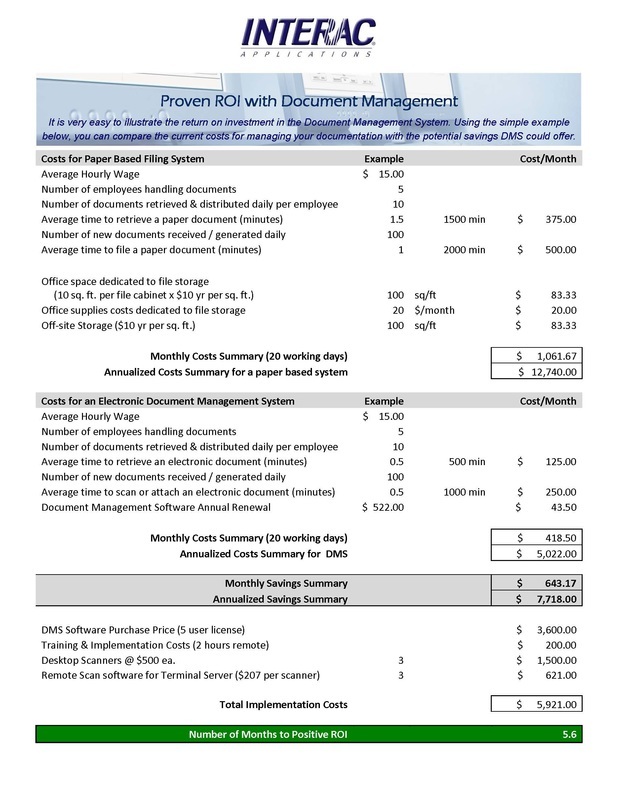 Save significantly by scanning the invoice copies. Review scanned invoices periodically to ensure accurate pricing. Improve on the .time spent matching AP invoices with PO’s and receiving documents to verify and approve them for payment. The Document Management System makes it feasible for vendors to submit their invoices directly to the accounting office for payment. Accounting staff have immediate access to all the documents from within the INTERAC applications, so they never have to leave their desk to find what they need. Field staff and managers are able to review all their invoices through Job Manager, so there is no need to keep copies in field offices. Using DMS to store client tax returns and information. ​W-2’s, 1099’s, brokerage statements, handwritten notes and work papers. The storage space required for the DMS documents is minimal. Significant savings in the man hours that were required to manage the filing and maintenance of paper archives and the elimination of boxes of AP related paper being generated every year. Eliminate cabinets full of paperwork that no longer has to be filed and stored. Eliminate documents that were frequently ‘lost in the shuffle’. Once attached to a record through DMS, it is always available to anyone who needs it. Implemented DMS without adding additional personnel.